The HTC Touch Diamond is equipped with 4GB internal memory only. It has no extension ports for external memory like SD or micro SD cards. It has a mini USB port however, and thats something we might be able to use to connect any USB device. We plug the memorycard into the USB adapter. We connect the USB adapter, with memory cart to the HTC. 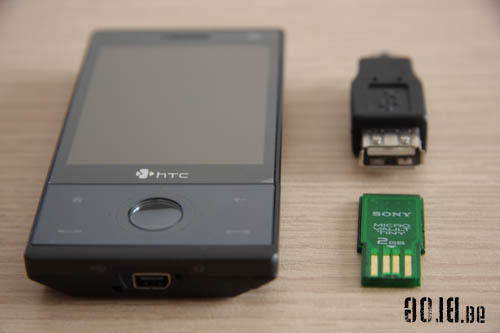 Tadaaa: external memory for a HTC Touch Diamond! Ok, blink your eyes, because things don’t look what they are. The pictures are real, no post processing is done on those. The screen of the HTC is real as well. But the screen that is shown is a manipulated screenshot shown as an full screen image. 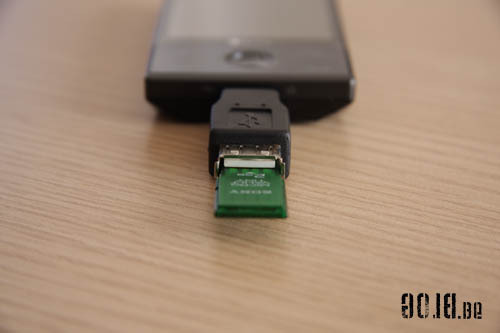 Currently it’s not possible to connect a USB device to the USB port of the HTC Touch Diamond as it is lacking the USB Host possibilities (no USB Host chipset) That’s why you can’t use any connected USB devices with the HTC. Via WMPowerUser.com I red an article that HTC is using some kind of a USB connector to flash their devices without the need of a computer. While booting you’ll have to press a certain key combination and that’s how you would be able to flash the device with a ROM that is stored on an external SD card, connected to the HTC via a Y cable. That Y cable is needed to foresee the USB port from power as this isn’t available from the device. 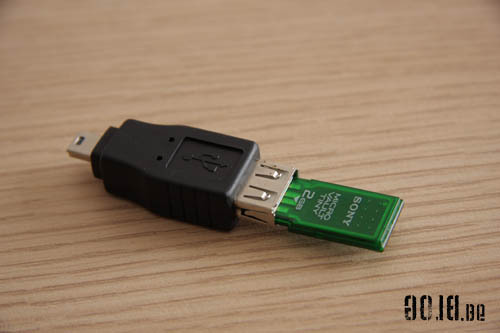 Something that won’t be needed with a real USB host, as those are providing power to the USB devices by themselves. There are also some other XDA-Developers busy experimenting with all kind of cables and drivers, but it seems that it was not very successful after all. Except maybe for Zeno and his USB Host Drivers. It seems to work on some devices, but I already tested it on my HTC with no luck at all. I think we have to admit, if the hardware isn’t present, it will never work.